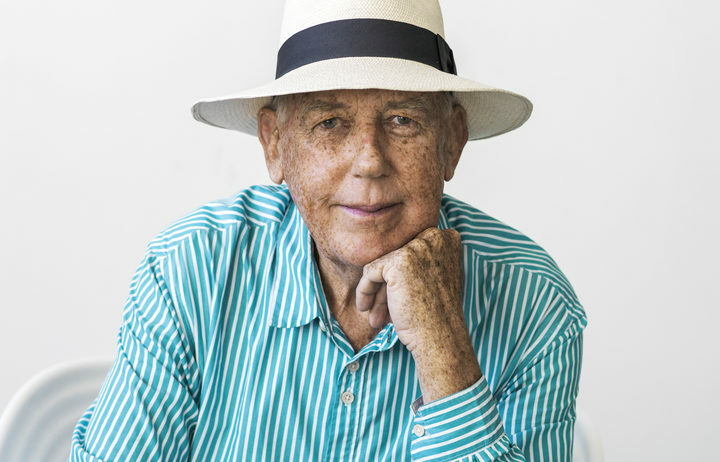 David John Mitchell, sailor, adventurer, writer, wit, teacher, musician, dancer, styler, reader and architect has left us. We will sure miss the old boy! As an avowed Aucklander, Mitchell may not be known as well down here, but he was a lovely character, always with an impish grin, previously sporting a lot of red beard, host to a cracking sense of humour, an acerbic wit, and a great sense of design. You may know him (if you’re quite old) as the author of “The Elegant Shed”, one of the first books on NZ Architecture to try and make sense of our colonial architectural history. It was also the first to be televised – imagine that – architecture intelligently presented on television! You can tell that was a long time ago… (and watch it here at NZ on Screen). But Mitchell had a loveable quality that made him perfect for tv – nearly always wearing a hat to protect his shining dome – he was one of those architects who have the art of being able to explain a design in 3 or 4 freehand sketchy black lines on a page. He was, shall we say, an architect’s architect. Offshore adventures in Rogue with Julie to many parts of the Pacific Islands, Asia, Hong Kong, Thailand, Andaman Islands, Sumatra, Maldives, Oman, Yemen, Egypt and Turkey – all in a search of an expression of the environment, culture and pattern. When they returned, they came ashore and built a couple of very interesting houses – one right way up, and the other, their own house, basically, upside down. I know, that makes no sense – I’ll have to find a photo. But that is what his architecture often did – turn everything upside down and approach from the opposite direction. Look, for example, at the Gibbs house in Parnell. 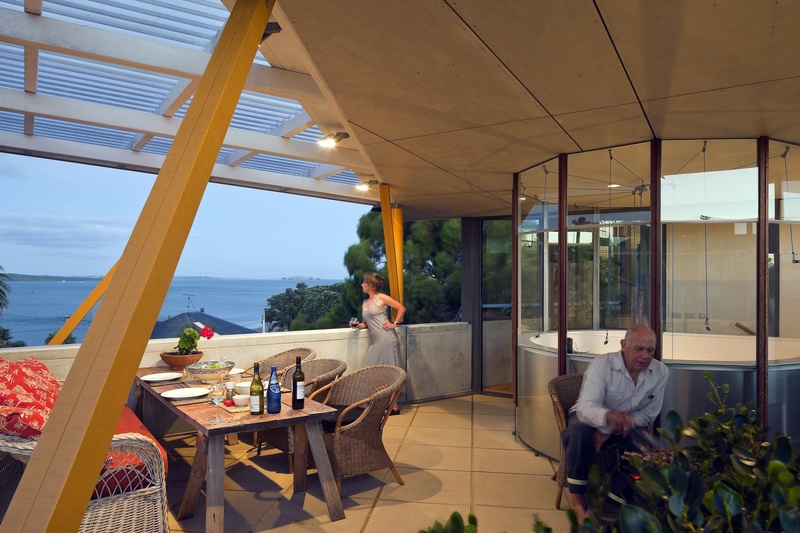 Totally ground-breaking for New Zealand architecture – post-modernism at its best (so often, PM is at its worst). There was a lightness to the architecture – ephemeral at times perhaps – heavy use of trellis to moderate the light, with a dappled effect, much like the bow of his broad, deep-rimmed hats. “There will be much written about David by people much closer to him than I, but I would like to talk about his personal influence on me. David was ahead of me at the Auckland University School of Architecture where even then, he was well known as an original talent and articulate speaker. Even as a young man, he was able to express his passion about architecture much better than most. He was not part of a particular group and the individuality of his voice had a great influence on me. Is it an Auckland/Wellington thing? “It was a bright day for Auckland when the new Music School at the University of Auckland opened in 1986. Designed by David Mitchell and Jack Manning, the school is built around a courtyard with a lovely, relaxed aesthetic, where flat geometric shapes and surfaces are offset by curves and cylinders, mostly painted white. The building flourishes those curves at you, yet with an elegant restraint. This was the mid-1980s, a time when restraint was hard to find. Post-modernist architects filled the eye with incongruous classical detailing, form ignored function and “fun” reined supreme. Sometimes it worked, but not often. The Music School did not embrace the new style. It was, rather, a building derived from modernism that brazenly set out to better the post-modernists at their own game: its true glory was not its functionality, but its facade. 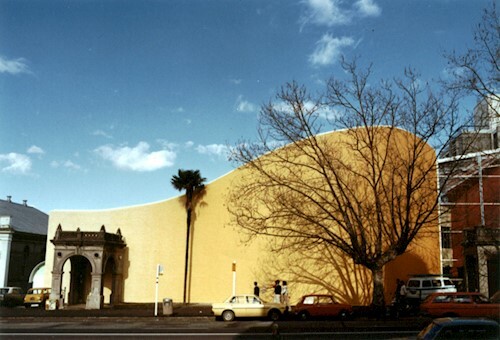 On the street you see a yellow stucco wall shaped like a wave with a sweeping curve, a pair of four-square Georgian stone archways, one of which leads nowhere, and a cabbage tree. It’s funny and beautiful, it feels like it’s in the Pacific and it has things to say about Europe. That colonial masonry is both frivolous and admirable, while the curved plaster wall pays homage to Le Corbusier’s mid-century masterpiece, the chapel at Ronchamp. Crickets? It’s also age and location. I just had a young whipper snapper in the office ask me who Dave Mitchell was, and what buildings he had designed – and whether any of them were in Wellington. As far as I know, Mitchell was a man possessed by Auckland. Nice harbour, shame about the city. nobody reads this blog any more. I used to find the cravat a bit irritating and the Gibbs House – well, it was the Gibbs’ house, wasn’t it? But I did have a sneaky admiration for the New Gallery, particularly the nifty shutters and the cafe balcony over Khartoum Pl. Most particularly I recommend inviting yourself into a lunchtime concert in the Music School courtyard. 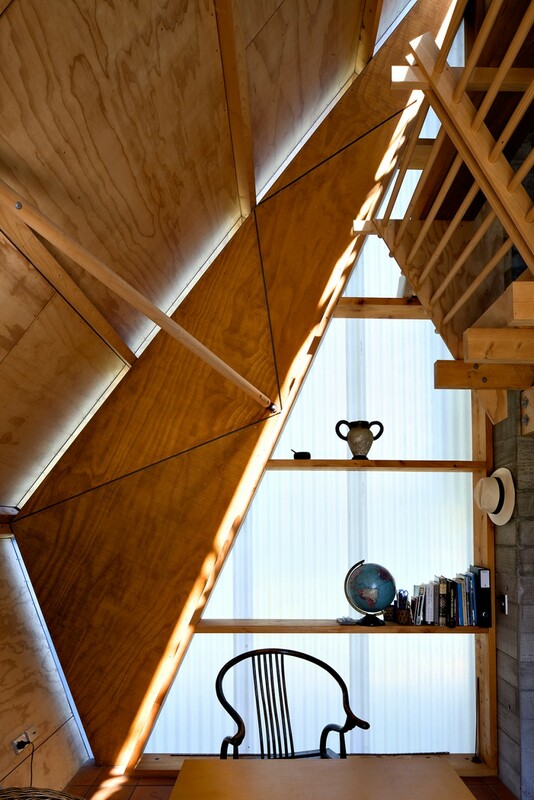 A pretty rare thing where a wall works so well on both sides – and in quite different ways. 60 MPa – thank you for saying that, I never knew. You have been, I think, one of the regulars reading and commenting on this blog for the last however many years (wait – is it ten years now? Wow!) So, thank you for your continued patience with my lax production, of what Maximus used to update quite regularly. I never seem to have the time to do that as much as Max did. But, still having too much fun to stop it now. Alan – Aaah yes, perhaps then it really is a Wellington v Auckland thing. Mind you, would your young whippersnapper know who Bill Tomato was? Is it just age?